Review: "Bang Tango: Ain't No Jive � Live (reissue)" - Sea of Tranquility - The Web Destination for Progressive Music! 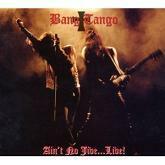 As briefly discussed in the articles about the bands first two albums, Ain't No Jive � Live completes the recently re-issued visit by the folks over at Metal Mind Productions who give us the MCA years of the Glam band Bang Tango. This recording was a quick attack of the band in action on the live stage and at only five tunes was a treat for their fans but at the same time a big "so what" from their naysayers. The band that was fronted by Joe LeSte had a couple of cool moments but with the rapid shift in what was happening in Rock & Roll and Metal, did not find the amount of necessary popularity that their diehards were assured was their destiny. The remained an underground entity despite all efforts and soon the band that also featured Mark Knight, Kyle Stevens, Kyle Kyle, and Tigg Ketler would become two separate entities using the same name. This album is a solid taste of what you might have enjoyed in concert had you gone and features two songs from their debut Psycho Caf� and two from the sophomore effort Dancin' On Coals. There is also a cover of Marc Bolan or T-Rex's "20th Century Boy" which has since become a staple cover tune for many bands. Maybe not so much back in 1992 when this album was originally released. I will admit to liking the "Someone Like You" tune after a number of listens back in the day, and the same for the bluesy "Midnight Struck" but when it came down to it, Bang Tango was a band that I cared little for as I was into much heavier stuff and bands that I felt were far more important to the scene. This is more for those fans who cannot move on from those tumultuous musical years and a nice way to remember one of its most unsung heroes. The digipak release features some historical liner notes and a six page foldout booklet. This re-issue from Metal Mind Productions gives you a brief summary of what Bang Tango brings to the stage in this 5 song snippet of them in concert. Taking 2 songs from their first disc and another pair from their sophomore effort then adding a cover of the T-Rex classic "20th Century Boy", you get the band in all their glam glory. "Dancin' On Coals" opens the disc and quickly sets the tone with it's fiery anthem like quality before they launch into their homage to one of the glam pioneers Marc Bolan and "20th Century Boy". Following that with "Someone Like You" which is still their trademark tune, the band then ends with the ballad "Midnight Stuck" and then one of their heaviest moments "Attack of Life". This EP sticks to their glam metal side and does not show the funkiness that they really started to show with their second studio release. While this might be them at their best it only shows half of what the band was all about. You ultimately have to say why bother with this type of release. It is too short to really be a good live representation and while the 5 songs are fun it just doesn't have enough to make me want to throw it in the player again. Now, when we get to the full length live disc, that just might be a different story.